Three continents, three women, and a fierce desire to share Africa with travelers. Meet the adventurous women behind bespoke safari company &Three Collective. Amboseli National Park in Kenya is known for its large herds of elephants and with Kilimanjaro as a backdrop, it’s one of &Three’s favorite destination. Once upon a time, we were three expats living in London. Stephanie asked Lanné and I to join her in working for a small safari outfit out of Kenya. We are each ‘those people’—those trusted friends who are great resources for all things travel. In a single year, we grew the business exponentially and realized that there was something special and dynamic about the working chemistry between the three of us. At the same time, we regularly saw people traveling all the way to Africa, spending a ton of money on their bucket list trip—but getting it wrong. So we set off on our own to realize our shared vision for travelers. We have something that nobody else offers: a niche Africa brand that offers three times the perspective and three times the insider knowledge. For starters, we are not travel agents! We are travel advisors who curate high-end journeys throughout Africa and her islands. What sets us seriously apart from the others is that we are. To go on safari—or “journey” in Swahili—is one of life’s greatest adventures. But safari to one person can be something entirely different to another. Some may seek raw and rugged Africa, where they sleep in tents, take bucket showers and eat scorpions. Others might want to be settled among gorgeous South African vineyards and attend black tie dinners on the Rovos Rail. 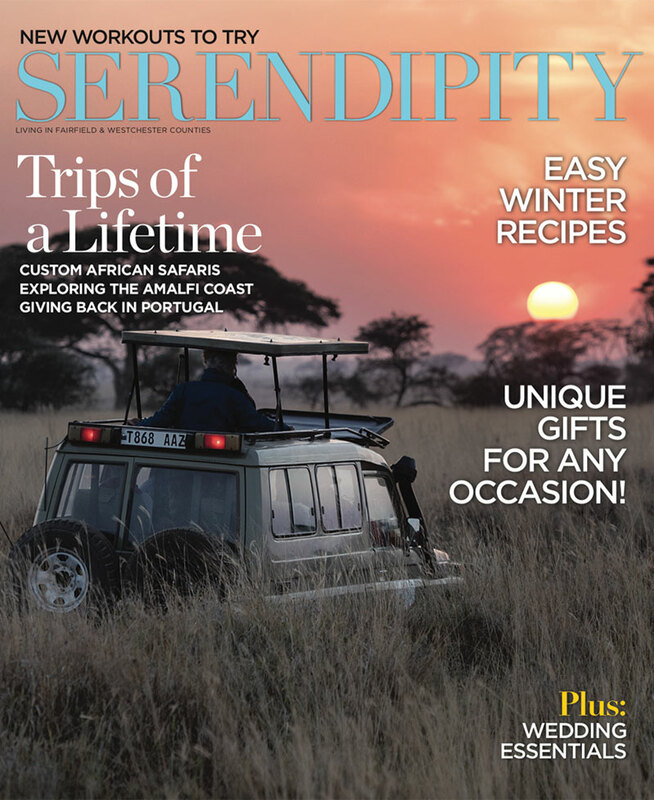 Then there are those adventurous souls who may be combining safari with a specific goal—summiting Mount Kilimanjaro or fishing the Seychelles. Still others may prefer a “sofa safari” where the migration of the wildebeests, elephants cavorting in a salt lick or a lion out on a kill could happen right outside of their room and they don’t have to go anywhere. To help travelers find their perfect trip, Bedford, NY, resident Claudia Church created travel company &Three with partners and friends Stephanie Capuano, who lives in London, England, and Lanné Tucker, an Afrikaaner living in Sydney, Australia. The trio’s shared passion inspired a business that bridges the gap between like- minded travelers and Africa in original and thoughtful ways. “I dare you to travel to Africa and not feel the tug to return,” says Church. Africa-specific—we eat, drink and breathe Africa. It is our passion. The second differentiator is our unique connection to the people on the continent—the true experts—and our collaborative process with them. Things change in Africa quite rapidly—our partners on the ground serve as our eyes and ears to keeping current in terms of camps, wildlife, management, the political climate. In addition, a private guide can really make or break a trip. We handpick all of our guides and take pride in matching them with our travelers. They live in the bush, on the beach, in the winelands. When you travel with our guides you really are welcomed and treated not as just another tourist but as a friend. How do you make it work with you all living on different continents? The three of us work around the clock—literally! We Skype at all hours of the day and night ... our preferred system is crack of dawn New York and late night in Oz. Claudia is in a bathrobe, Steph is in a cab and Lanné is pouring a glass of wine. We have very different styles which we see as a real asset. The value to the client is our combined perspective. As women, collaboration is in our DNA. As a team, Africa is in our blood. As mothers to a combined eight children, we are sympathetic to each other’s balance. And we laugh a lot. Lead time is everything for first picks. Ideally, one to two years out, particularly around the holidays (though we’ve been known to put something together with only three weeks notice). Travel to Africa is a different beast—it is quite complicated as safari entails a lot of internal maneuvering: flights and transfers, differing accommodations, park fees, guide fees and permits. Going on safari is expensive. It is important to remember that the price of a safari includes everything—food, drinks, accommodations, internal flights and transfers, park fees, guide fees and activities. On safari, guests travel from location to location on small planes with weight restrictions on luggage so you really have no choice but to pack light. Worry not, daily laundry service is included in your stay at most lodges and camps. It begins at the planning stages with choosing which country or countries to visit, and your travel style. We handpick all of our private guides and match them to your group—not only are they a bonus for their wealth of knowledge and fun but they also serve as an insurance policy should anything go wrong. We are all about flexibility, so if little ones want to stay behind or cut out early, we’ve got you covered. If you return home not having changed or been humbled in some way, then we haven’t done our jobs. “I would combine South Africa and Botswana. I would start in Cape Town and the winelands, move onto the Kruger or the Sabi Sands where you are virtually guaranteed to see your “big five.” And then head to a tented camp in Botswana for pristine wilderness and incredible game viewing—often in the water! For overall amazingness, my pick is Botswana: world-class game and guiding, five-star camps, incredible food and wine, tribal culture, safety and warm people. The Okavango Delta is a wetland located in a desert with an incredibly biodiverse ecosystem and a rich concentration of animals in such a pristine environment. For me, Kenya is magic. It is romantic, nostalgic Africa at its best. Wild and free. No rules. The variety of ecosystems, landscapes and wildlife is amazing. And the coast! The Kenyan coast is off the charts. Crystal blue water, white sand beaches and off the charts marine life. I would combine bush and beach for my ultimate safari. We are all very much looking forward to one of our collective bucket list trips this May to the Skeleton Coast in Namibia. I am particularly excited to stay at the Serra Cafema camp in the north—on the border of Angola— and to spending time there with the Himba community. We’ve been talking about returning to Tanzania and going deep. I’d love to visit the less obvious areas—the Ruaha and the Selous and then hit the islands off of Tanzania for bright blue water and white sand beaches. I’m also keen to visit the new Singita Kwitonda Lodge in Rwanda (opening August 2019). The Democratic Republic of Congo. Unrefined and raw, the DRC is not for everybody. I am a primate freak. I would love to visit the baby orphaned apes at the base of the Virunga Mountains. The forest is full of colobus monkeys, blue monkeys and chimpanzees. You can see gorillas and elephants at the same time. The beautiful Kenyan coast is back in business and the weakened South African Rand is luring visitors to South Africa to the point that we are booking travel there two years in advance for peak times. The food and art scene in Cape Town is currently off the charts, and we have many people asking to build that into a traditional safari experience.